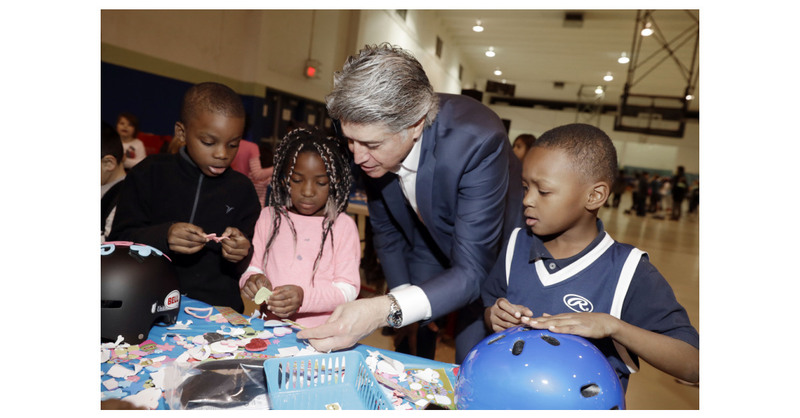 LAS VEGAS–(BUSINESS WIRE)–UnitedHealthcare today donated $25,000 to the Boys & Girls Clubs of Southern Nevada and 150 bike helmets to encourage kids in Las Vegas to make an active, healthy start in the New Year. The donation is the culmination of a fundraiser held during CES 2018, where members of the UnitedHealthcare Pro Cycling Team, along with employees and executives, encouraged conference attendees to ride stationary bikes at the UnitedHealthcare booth. For each mile pedaled, UnitedHealthcare donated $1 – up to $25,000 – to the Boys & Girls Clubs of Southern Nevada. The check was presented at the Lied Memorial Boys & Girls Club of Southern Nevada, where UnitedHealthcare also donated 150 bicycle helmets to club members. Leah Thomas, a member of the UnitedHealthcare Pro Cycling Team, helped fit each child with their helmet, and provided a lesson in cycling safety and advice about the best exercises to do before a bike race. UnitedHealthcare’s mascot Dr. Health E. Hound joined the UnitedHealthcare pro cyclists to help the children decorate their helmets with stickers and decals, provided healthy snacks and posters, and signed autographs. Previous articleDr. Rakhee Bowker selected as Top Female Professional in Healthcare for 2018 by the International Association of Top Professionals (IAOTP).